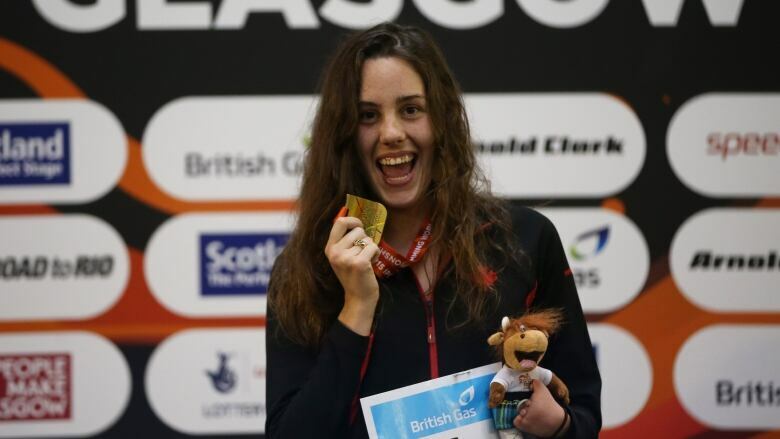 At the recent Canadian swimming trials in Toronto, 22-year-old Aurélie Rivard added three more gold medals to her already impressive collection. The Saint-Jean-sur-Richelieu, Que., native has high hopes for more at the Tokyo Paralympics in 2020. Rivard is looking to defend her three Paralympic titles and the world records she set at the 2016 Paralympics in Rio. Rivard has even loftier goals — to get her world records closer to the times of able-bodied swimmers and to keep smiling. "I want to enjoy it more because I have been so stressed out in past years," she said. "I was just wishing for it to end." Today, Rivard is a completely different person from the one of her teenage years. "I learned to love swimming because at that time I was struggling with a lot of mental health issues." The pool became her safe haven. "In the pool, that's the only place where I felt comfortable — not different, not disabled. I felt just as fast as the other kids who had two hands." Rivard trains with able-bodied swimmers and tries to beat them, including her identical twin sister Charlotte. Aurélie was born with an underdeveloped left hand. But Charlotte said she never thought twice about her sister's hand until other kids would cruelly point it out. "Kids don't treat differences right. It was a wake-up call." Aurélie remembers when things changed. "Growing up I was like, some people have brown hair, blue eyes and my hand was like that. I thought it was a physical trait. I didn't know I was disabled. I found out when I was 12 through people who made me feel disabled and different." That's when the twins, who were best friends, were separated for the first time as Aurélie went to a special sports school to train more seriously for swimming. That's when Aurélie's troubles began, according to Charlotte. "I didn't get why it would be a motive to get bullied or rejected," said Charlotte. She's a human being. She's brilliant. She's beautiful. I couldn't understand why she could possibly be rejected for a hand." Trying to fit in like other teens, Aurélie was shy, lacked self-confidence and found herself vulnerable. "I didn't know how mean people could be," she said. "They threw food at me. They insulted me." One day in gym class during the first week of school was particularly difficult for Aurélie. "We were playing soccer, and me and my sister were really good," said Aurélie, who had been playing soccer for 10 years by that point. There were two team captains and they had to pick teams. And they didn't pick me. They started playing while I was still sitting down so I left crying." The treatment wasn't any better at the pool. The other swimmers called her a prune and said they hated prunes. Rivard started hiding her left hand inside her clothes thinking it was the reason for her problems. She also suffered from anxiety and panic attacks. She only recently became comfortable talking about her early struggles. Sitting down for an interview with CBC Sports just after the trials, the pain starts coming back and the tears well up in her eyes. "I wanted to give up on swimming," she admitted. "I was done with swimming. I didn't think it was worth it. …. Oh my God. I don't like to talk about it." Rivard fights through the tears and continued sharing her story hoping it can help others. "I didn't talk about it for years because I was embarrassed. But I realize there are so many people who go through that as well." Things reached a tipping point one day at the pool when a teammate threw an ice cold water bottle at Rivard, who uncharacteristically turned around and threw the water back in her teammate's face. "What ended the bullying was me standing up for myself once, and deciding that I was not going to finish my high school or spend the rest of my life feeling like this. That day changed my life," she said. Less than two years later, Rivard won a surprise silver medal at the London 2012 Paralympics at 16. Her sister Charlotte was there. "We were both thinking the same thing about those who made her feel worthless," said Charlotte. "It was nice because when we came back to school after London, everyone was clapping and screaming. I think it was the best revenge." Aurélie agrees and has a message for youth facing mental health challenges or bullying. "Be selfish," she said. "Don't let anyone get between yourself and your dreams."